These colorful, whimsical spiral cookies are half-dipped in melted dark chocolate and then in crushed peppermint candy canes. In a large bowl, cream butter, sugar and salt. Add eggs and peppermint extract; mix well. Remove 1 cup of butter mixture and place in a medium bowl; set aside. 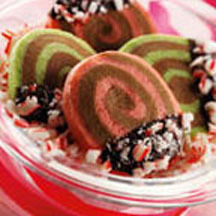 To remaining mixture, add red or green food coloring (until desired shade) and 1/4 cup crushed candy canes. Add 2 cups flour and 1 teaspoon baking powder; mix well. On a large sheet of waxed paper, press dough into a large rectangle (about 1/2-inch thick), cover with a second sheet of waxed paper and chill 30 minutes. Add melted chocolate to reserved butter mixture; mix well. Add 2 cups flour and 1 teaspoon baking powder and mix until well blended. On a large sheet of waxed paper, press dough into a large rectangle, (about 1/2-inch thick) cover with a second sheet of waxed paper and chill 30 minutes. Remove dough rectangles from refrigerator and roll each into larger (9x16-inch) rectangles. Brush one layer with egg white and place other layer on top. Trim long edges. Roll up lengthwise into a tight roll, resulting in a 16-inch long log. Wrap in plastic wrap and chill 30 minutes. Slice into 1/2-inch slices, and bake on parchment-lined cookie sheets for 10 to 12 minutes. Cool completely. Break up chocolate and melt in a shallow, microwave-safe bowl for 30 seconds. Stir and continue to microwave in 10-sec. increments, stirring until smooth, but not warm. Dip half of each cookie into melted chocolate and sprinkle with crushed candy canes. Place on waxed paper until chocolate sets.